"I want to make a tornado... I see something incredibly energetic and wild." These words from Douglas Wright, New Zealand's leading contemporary dancer and choreographer, about his last major work, 2006's Black Milk — which toured New Zealand and Australia — could well describe himself. Black Milk has now been documented in this remarkable book, based around photographs of rehearsals and live performances. The book is not only a testament to Wright's impact as a choreographer, but is also a stand-alone work of art photography by John Savage. Featuring the highest quality of production, it has also been designed by award-winning designer Alan Deare. On seeing the initial photographs, Wright says: "I felt that here, for the only time in my experience in photography, someone had managed to capture the breathless sorcery of live dance-theatre without pulling its wings off." The compelling images are accompanied by text from Wright, who offers insights into his intentions, working methods and artistic influences. Writer Leonard Wilcox expands on the challenging workís meanings, essentially ìconfronting a death-defying culture head onî and the acceptance that life and death are intertwined, not separate states. Critics and the general public seem united in their reaction to Wrightís provocative masterpiece. Black Milk has been variously described as "dark and violent, subversive, powerful, disquieting, death-challenging, disturbing, nightmarish, multi-layered, voyeuristic, harrowing, horrifying, but also exhilarating and hilarious". Wright has said: "I won't accept anything that doesn't haunt me." He delivered, as Savage's startling images confirm. 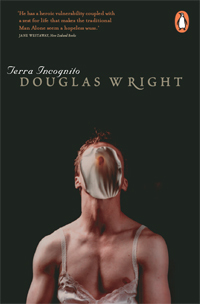 Terra Incognito is the true story of a journey through the dark night of the soul and the eventual triumph of creativity, told in a ringing, unforgettable voice. Picking up where his acclaimed Ghost Dance left off, Douglas Wright chronicles, after a series of bereavements, his descent into depression, despair and suicide. We meet the inhabitants of Hallburn House, a respite centre for people with HIV, and are given a rare, compassionate and sometimes hilarious glimpse of how those on the margins of our society contrive to live, love and die. Shimmering through the dark fabric of this account is a golden thread: the slow growth of an idea for a new work of dance-theatre, Black Milk. In this unique description of a celebrated artist’s process, we are shown how works of art are sometimes born – and also how they sometimes have the power to resurrect. 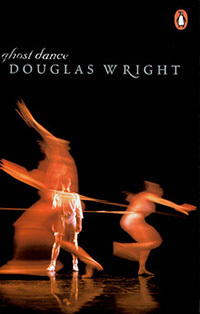 Douglas Wright’s Ghost Dance won the New Zealand Society of Authors E. H. McCormick Best First Book of Non-fiction Award at the Montana Book Awards in 2005. Ghost Dance has been included in 50 Gay and Lesbian Books Everybody Must Read by Richard Canning. Review essay of Ghost Dance by Richard Canning from 50 Gay and Lesbian Books Everybody Must Read (2009).